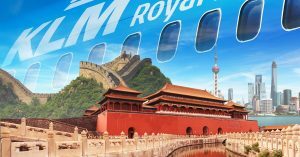 KLM Royal Dutch Airlines today acceded to the enhanced cooperation between Air France and China Eastern Airlines. KLM and China Eastern Airlines will offer codeshare flights on the Amsterdam-Shanghai route. Passengers will also gain access to three new destinations in addition to the existing 12 codeshare destinations. China Eastern Airlines’ first flight from Shanghai landed at Amsterdam Airport Schiphol on Sunday June 26th. China Eastern Airlines will operate four roundtrips a week between Shanghai and Schiphol from this day. KLM and China Eastern Airlines are also embarking on discussions aimed at further intensifying their cooperation. KLM and Air France already have a close relationship with China Southern Airlines. KLM has been working with China Southern Airlines for the last decade. The intensive cooperation between KLM and China Southern Airlines covers six routes between the Netherlands and China, which connect to 35 codeshare destinations each.